Facebook’s research is based on the idea of Emotional Contagion, which can be defined as the ability to transfer emotional states to others, leading them to experience the same emotions as those around them without their awareness. The occurrence of emotional contagion between individuals with in-person interactions is well established in the Psychology world, and with this experiment Facebook attempted to learn if emotional contagion can occur outside in-person interactions, i.e. if textual communication alone – as opposed to verbal communication with its nonverbal cues – is enough to form emotional contagion. Posts were determined to be positive or negative if they contained at least one positive or negative word, as defined by Linguistic Inquiry and Word Count software (LIWC2007) word counting system, which correlates with self-reported and physiological measures of well-being, and has been used in prior research on emotional expression. The posts were classified as positive or negative according to the above criterion and then a certain percentage of them was removed from the News Feed so the user will be exposed to more positive or negative content, respectively. The study design was quite simple, but because the general rate of positive (46.8%) and negative (22.4%) posts in Facebook is different, the researches had to use two separate control groups – one for the Positivity Reduced group and the second for the Negativity Reduced group. 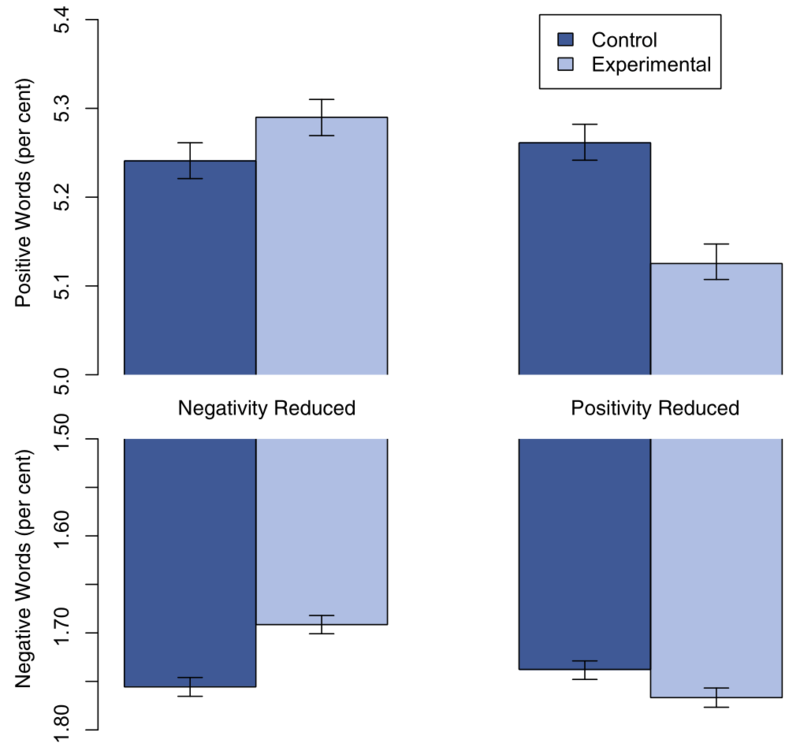 The control condition for the experiment was defined as the removal of the same proportion of posts from the News Feed as that of the respective test group (Positivity or Negativity reduced), only completely at random. (percent) generated people, by condition. Bars represent standard errors. What can we Learn from Facebook’s Study? As professional Translation Practitioners on whom the power of semantics and the role of linguistic subtleties in effective communication is not lost, the study results come as now surprise. They just further reinforce the fundamental role that effective use of language has in human communication. The first lesson is a bit of an extension (or even extrapolation) of the research results on my part, but I couldn’t help but think about how often the importance of writing skills in translation is overlooked; how the emphasis and focus gradually shift from expertise and knowledge to rudimentary skills that can be considered prerequisites to the profession rather than qualifications, and/or even to superficial areas such as the workflow, and how misguided all of this really is. In its core, every translation work is an interpretation (or adaptation) of the original, and as such it involves rewriting. This is one reason why even two excellent translators are likely to create different versions of the same source document, and while both versions might be good, they will also be different – sometimes even to a point that makes one version more effective than the other in a specific context and use. It is the subtleties in the linguistic and cultural adaptation, such as the choice of tone, style, semantics, and overall rhetoric, that are likely to make-or-break an effective communication. Some in the translation space insist that translation is a technicality. A data, or big data problem. For them language is just a data set that can be transposed to a different data by transforming words and basic grammatical structures from one language to another. While it is unlikely that even those Language Transformation Mills with their unskilled and/or HAMPsTr-centric workflows will manage to turn a positive communication piece into a negative one (or vice versa), they can do even worse. By following this liner, one-dimensional, technocratic, and overly simplified approach, their transformation workflow can easily strip the communication from all the linguistic and cultural subtleties, otherwise known as the elements of effective human communication, thus evoking the emotion that every communicator fears the most – indifference. The second lesson that came to mind while reading the paper and thinking about Facebook’s research, was the importance of balance and boundaries. There is a lot of negativity, disinformation, bad advice, sponsored content, and a general atmosphere of gloom-and-doom in many translation communities and publications. Coincidentally or not, many of them are also the major gateways to the profession and main sources of information for many translators. Facebook’s study should remind us just how easily behavior can be manipulated by the type of content one is exposed to, and alert us to how this knowledge can be abused by people who stand to gain from such manipulation. This is not to say that we should shy away or retreat from discussing controversial topics or refute misguided claims and notions about our profession, it means that we need to be constructive about it and do it in the interest of education. Knowledge, as opposed to information (that can be selectively used to ‘divide and conquer’), is one important key for building one’s professional identity and viewpoint, and breaking out of the poverty and misery culture nurtured by so many. In this day and age of information overload, it is important to remember Sturgeon’s law, and filter out the noise and the time-wasters-and-energy-drainers. It is important to maintain balance and not let just about any time-waster-and-energy-drainer out there to command the same time, attention, effort, and influence as true business partners with whom one shares professional and commercial values. With all the (justified) controversy surrounding its inception and conduct, Facebook’s research gave us some valuable insights and reminder into the role and power of language in driving human emotions and behavior through communication and information (as opposed to knowledge) sharing. I want to conclude this article by sharing my recommendations for some knowledge resources and activities that can help in regaining focus. At times we all get discouraged (I know that I do) for some reason or other, but as Facebook’s research has demonstrated, breaking this cycle may be just one positive experience away. If you have any advice, resource, or general comment about the article that you would like to add or share, please let me know in the comments. Excellent analysis, Shai. I think your two main points both form part of your initial posit: Translators are (and must be) writers. I have written about this on more than one occasion and never tire of reminding non-literary translators of this fact.This is something many novice translators, surprisingly enough, either don’t know or have never thought about–especially in the cases of those who come to translation more because of their command of two or more languages than because of their love of words, reading and turn of phrase. I think that in translation in general there is all too often a tendency to “get the lyrics right while disregarding the music” and this may be because of how translation has traditionally been learned, with far too little stress being placed on, first and foremost, learning to read and write effectively prior to sitting down to “transfer” a word in one language into a roughly equivalent term in another language. What we as human translators bring to the table, in a world in which a public enamored of devices and computing is bombarded with the hype about machine translation, is the fact that we are, indeed, human. And because we are human our thought processes, writing skills and our recognition of nuance, register and emotional content are what set us apart from the robots, which, basically, not matter how advanced they get, can only match words or phrases in one language to words or phrases in another. This is, even in technical, legal and instructive writing (which MT enthusiasts write off as immune to the need for quality translation), our capital and our contribution to not merely proper, but superb communication. To not realize, then, that translators are (or must be), before anything else, effective writers is to miss the point of translation (and, indeed, of communication) entirely. Thanks for pointing out the importance of this topic. Thank you for taking the time to comment, Dan. Translators are communicators (I sometimes also like to refer to it as being ‘language and culture mediators’). Everything that needs to be translated has a communication value to it. Otherwise, it wouldn’t have been translated – and possibly not even created – in the first place. It is crucial to get away from the “but the dictionary has it” syndrome and move to a far more professional level of understanding that translation should be written for the readers, not to satisfy some artificial and technocratic QA processes that deal with the document structure, not with its communication qualities. Language transformation is indeed not translation. It might be suffice to know two languages in order to transform one language into another, but translation is a far more complex and multilayered process. The fact that the most rudimentary prerequisites to the profession are becoming de facto qualifications is reflective of this misunderstanding; surprisingly and sadly, many who claim to represent the profession also fail to understand or prefer to ignore this.